Shallow square dish with tab handle. Green satin glaze to exterior and handle. White gloss glaze to interior of bowl and base. Unglazed foot ring. These are probably the earliest ramekins that I have found and can positively date. Before the studios that form the majority of my collection started making ramekins, there were a lot of people still making domestic pottery. 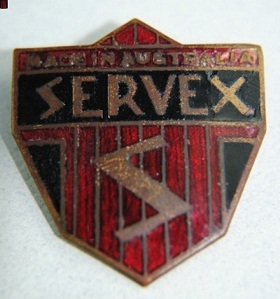 Long, long ago back in this time when Australia actually made stuff there and before our Arts-Law politicians got sucked into this post-industrial ideology, was a company called Servex, an early electrical and electronics company in Melbourne, Victoria. It was run by an early version of what today is known as a tech-head. Back then you could buy heaps of good quality stuff that was locally made. Later, when television again came to our shores (look up Henry Sutton from Ballarat who really invented television (GOOGLE “Telephane” even before radio came along) there were many, many local makers. Servex has become a not uncommon name amongst the IT crowd these days. The company that I am talking about has largely disappeared, having undergone the inevitable takeover from the overseas big boys. Back in the mid 1930s, Servex began making a wide variety of products. 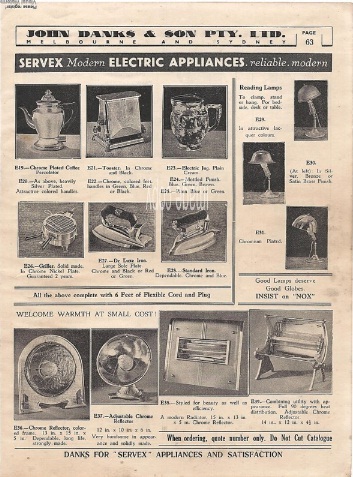 Their biggest money-spinner was electrical goods. 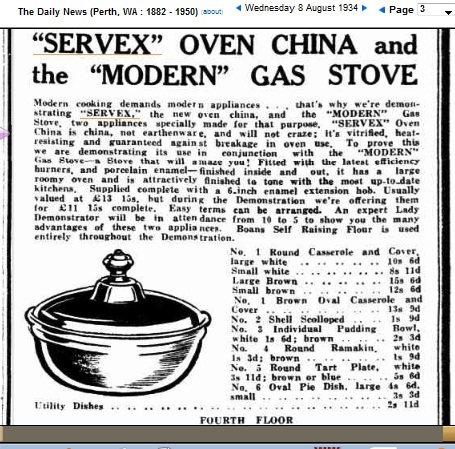 They also made appliances for other brands, for example, refrigerators for Astor were made at the Servex factory in Hamilton Street Huntingdale, but for the purposes of this post, I will try to stick to the ceramics part of the business. 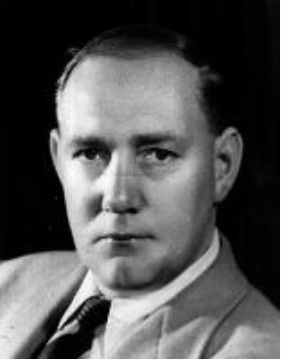 The powerhouse behind Servex and Astor was Arthur Warner, later Sir Arthur, an electronics pioneer in Australia. Look him up, he is also worth reviewing. His main claim to fame is his founding of GTV Channel 9 in Melbourne, now part of the 9 Network. (He applied for a television licence back in 1934, over 20 years before TV returned to Australia.) He was also an influential Victorian State politician. 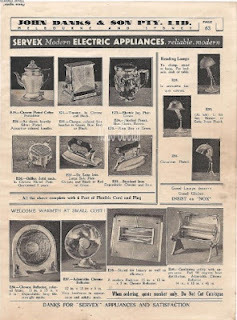 Concurrent with the ramekins, another Australian invention, electric jugs were made by companies such as Nilsen, Speedie, Hecla, Sunshine Electrix, Vulcan, Koster, Hotpoint and Servex were a must have in every home that could afford them. 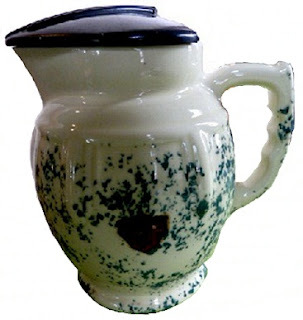 If you have a Wynyard Elite, then you have the top collectible electric jug so treasure it. The body of these jugs was ceramic, usually with a bakelite lift-up lid. They are now a class of collectible in their own right. Just who actually made the jug bodies is a separate study. Haigh Resistances Pty Ltd in Brighton Victoria were one, another was Nilsen Porcelain Australia, located in the unusually named Jackass Flat, just north of Bendigo Victoria (they are now in West Heidelberg, and make electrical accessories). Bendigo Pottery was just up the road a mile or so. Other potteries at Bendigo, Eaglehawk, Epsom and California Gully also made jug bodies. I think it likely that these ramekins were also a product of Nilsens at Bendigo although I cannot find any evidence for this. As well as making ceramic jugs, Servex, like some other manufacturers, also made a range of kitchenware and dinnerware. Essexware and Diana also made ramekins of a similar design (see the “Ovenmaster” post). Part of this Servex range were these ramekins; they are from a range called “Bohemia,” not to be confused with the Czech crystal and glass people. Their small size is an indicator of how serving sizes have changed over the decades. Sir Kenneth George Luke (11th November 1896 to 13th June 1971) is yet another of those great self-made men of Australia in the twentieth century and deserves much more space than I allow him here. Please look him up elsewhere to see his story, it is worth reading. Of relevance to these ramekins is his ownership of “Paramount Plate.” Just about everbody’s parents or grandparents would have had some of their silver-plate in their homes. “KG” as he was known, began his working life as an apprentice engraver at a silver-works in 1910. By 1921 at the age of 25 he had become a partner in a metal spinning and silverware business in the Melbourne suburb of Carlton. He was the owner by 1925. A keen sportsman, he also later became a long-term President of the Carlton Football Club (1938-1955) and President of the Victorian Football League from 1956 to 1971. He modernized the administration and professionalised the game. His legacy endures. His company K.G. Luke (Australasia) Ltd became a public company in 1953 but the electroplating part of the business was located at 28-58 Queens Parade, Fitzroy North, Victoria. They also made the medals for the 1956 Melbourne Olympic Games. The group was taken over by National Consolidated Ltd on the 19th of October 1983. I have a large Servex electrical hotplate with two temperature knobs (retro looking) made from aluminium, very solid and heavy, no missing parts. I'm wondering how much it would be worth and what year Servex discontinued business. Do you know? Valuation of electrical appliances is not my field. Servex was wound when it was taken over in June 1953 by a company called "Electronic Industries." Hi, I enjoyed reading you're artical and thought you might be interested in some info I have found. I am a collector of Aust and NZ single phase electrical wiring devices and fittings. Two companies stand out for me, Servex, who I have a metal clad power point. (Looks similar to a rowco design) and Nilsen pocelain who I beleive is linked to Nilsen Cromie, who made federal fuses and switches and later became part of Nilsen electrical Industries along with Rowco. Two other names in Victoria that made pocelain insultors, for heaters, kettles etc... are Southern Cross Porelain "Essco" and Sunshine Porcslain Pottrries., who deffinetly also made suface mounted socket bodies for a Sydney based company in the early 1930's and power pole insulators. I Have a Tea Service. 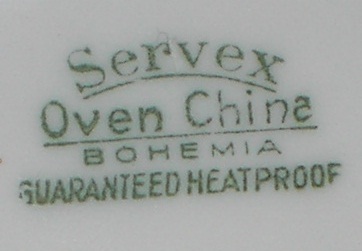 Servex Oven China Bohemia Apple Green. It consists of Teapot, Milk Jug, Cream Jug, Sugar Bowl And Another Small Bowl. It Has Never Been Used. Would You Be Able To Tell Me approximately The Value Please.